Every day, Creatingway always received some different 2D&3D drawings for quotation on a new idea or design. At this time, whether you have mark specify the dimension for critical areas on the drawings, or the maximize tolerance you requires. 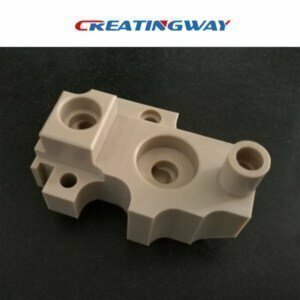 What Tolerances We Can Provide for CNC Prototype Manufacturing? Why we need to do that and what it means for your parts, Creatingway will take these information to you in this blog. Tolerance is a quite simply the acceptable deviation away from an exact measurement or dimension. It’s usually expressed as a “+/-“value. For many mechanical manufacturer, the purpose of making a tolerance is to determine the geometrical parameters of the parts so that its variation is within a certain range, thus to meet the requirements of interchangeably or matching. When manufacturing, would like to get one exactly with no any errors dimension of the parts is neither practical nor desirable in most instances. Since there will always have some slight movement, maybe because of the raw material, advanced the equipment or different machining progressing etc, so it must to be accounted before production. At this time, we need to find a compromise way that using minimum cost and production time to create an acceptable the tolerance. Perfection isn’t possible, so instead we need to standard. It’s an international industry standard for the determine tolerance, including in linear and angular dimensions, radius and flatness etc, this standard was launched by consensus from manufacturers all over the world. And based on its reliable and repeatable on modern CNC machines using high quality material and cutting tools, so and for now, it had been widely used in industrial production. How will tolerance affect your cnc prototype manufacturing? ISO 2768-1 which is an international tolerance standard, and it can ensure that all the holes, linear and slots are in the right location, screw will go smoothly into their mating threads, not too loose or too tight, and cover will close flat with a nice even seam all around. As one professional CNC machining manufacturer, we will also strictly adhere to international tolerance standards to ensure all of the parts are high quality & close tolerance to meet the final user requirements. Why are tight tolerance not always a good thing? A tight tolerance will mean that increased the production costs and longer production cycles. Since they need advanced equipment, precision structures and climate-controlled clean rooms etc. Such as: luxury watches or aerospace and Automotive components. But it’s rarely be required for many low-volume manufacturing and the rapid prototypes. And even if you have own advanced equipment, the first-class technicians, good raw materials, and you will be able to make one part perfectly, whether it will mean the part can be used perfectly as well. At this time, we always ignore a reality for all materials expand and contract with changes in temperature, so it may will not be perfect once it was used. What tolerance is best for your next cnc prototype manufacturing? At this time, you need to know exactly what your product is for and how it will be used? And who is your product the final user for? Then we will strictly produce all kinds of the parts according to ISO 2768-1 tolerance standard. It will be best choice because of it had been widely accepted and approved by the final users from all over the world.